Note: This article was originally published in the June 2011 edition of Electronics Cooling. Accurate reliability predictions for outdoor electronic equipment depend on realistic characterizations of ambient operating conditions. However, unlike the relatively constant indoor environmental conditions, outdoor conditions can vary significantly from day to day. Mean-time-between-failure (MTBF) estimates are highly dependent on operating temperature. Therefore, the use of realistic ambient conditions is essential when calculating MTBF for electronic equipment operating in uncontrolled outdoor environments. This article defines realistic ambient temperatures, wind speeds, and solar radiation conditions for Yuma, Arizona, one of the hottest cities in the United States. These can be used as baseline environmental parameters for calculating MTBF of electronic equipment operating in this uncontrolled outdoor climate. A thermal analysis of a cellular Remote Radio Head (RRH) was carried out to illustrate how this climate affects RRH board temperatures used in reliability models. This paper also defines a common methodology for applying average ambient temperature, wind speed, and solar radiation to thermal analysis and MTBF calculations for similar cellular electronic units and other outdoor electronic equipment. It is shown that the average annual ambient temperature for Yuma, Arizona (a near-worst-case hot, dry climate) is 22.9oC, with an average annual wind speed of 2.5 m/s. The 22.9oC average ambient temperature is the maximum use condition, yielding a lower bound on calculated MTBF. A CFD thermal simulation of a typical RRH subjected to “maximum” solar load shows that a wind speed of 2.5 m/s reduces average board temperatures by approximately 11.0oC compared to zero wind speed. The predicted average daytime solar rise of the boards is 1.5oC. All of the resulting board temperatures for use in reliability models are higher than the default 40.0oC value assumed for indoor electronics. Methods of determining average operating conditions for outdoor equipment based on wind speed, solar load, and solar radiation are not addressed in reliability prediction procedures. The purpose of this paper is to define the average annual ambient temperature, wind speed, and solar radiation for use in predicting the reliability of outdoor electronic equipment. Proper definition of these environmental parameters is essential for the determination of realistic circuit board and device operating temperatures used in reliability models. For indoor equipment mounted in forced-air-cooled racks or cabinets, operating temperature and airflow are relatively constant. As the internal temperature within the equipment increases due to greater demand for output power, fan speed automatically increases, maintaining a nearly constant internal temperature. Other environmental conditions such as solar radiation and wind speed do not apply. This is not the case for outdoor-mounted electronic equipment. The temperature within these units varies considerably depending on geographical location, daily and seasonal temperature variations, solar radiation, and wind speed. Reliability predictions, such as MTBF, are statistical calculations based on “long-term average” operating temperature over the steady-state life of the product. These operating conditions include average ambient temperature and the effects of wind and solar radiation on circuit board and device operating temperatures. Telcordia’s SR 332–CORE  uses an Environmental Stress Factor to account for the variability of outdoor environmental conditions compared to the relatively constant indoor environment. Hence, if the long-term average outdoor ambient temperature is the same as the indoor ambient temperature, the calculated MTBF of an electronics module operating outdoors would be 1.0/1.5, or 66.7% of the indoor MTBF. Additional accuracy can be obtained by using a weighted-average-ambient temperature instead of a simple average. The resulting temperature accounts for the higher maximum ambient temperatures in a desert city such as Yuma, Arizona compared to a tropical city such as Miami, Florida. Miami has the higher average ambient of the two cities, while Yuma has the higher weighted-average-ambient. An example of outdoor electronic equipment used in the cellular industry is a Remote Radio Head (RRH). This type of unit is sealed to protect it from contamination by dust, water, ice and snow. Circuit boards and electronic devices are mounted onto heat sinks, which cool the electronics by natural convection. The internal air temperature above each circuit board is approximately equal to the average board temperature. Figure 1. a) Remote radio head with sun cover removed, revealing one of the unit's two heat sinks. b) Remote radio head with sun cover installed. A typical RRH unit is shown in Figure 1. Heat sinks are located on the front and back of the unit. The total heat load of the unit is 230W. The transmit power is 60W. This particular RRH is 290mm wide by 590mm tall by 200mm deep. 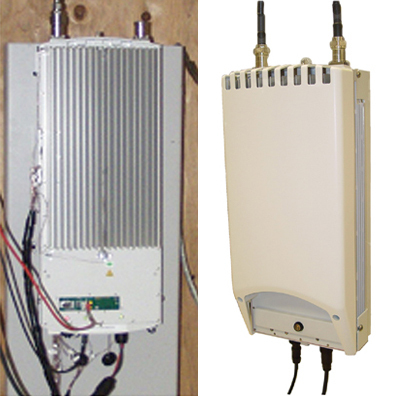 These units are installed at the top of cellular towers or on rooftops to communicate with cell phones. This RRH unit is designed to operate outdoors over an ambient temperature range of -40oC to +50oC, zero wind speed and solar insolation of 1120W/m2. Component temperature limits are as low as 85oC. This section of the paper examines public-domain ambient temperature, wind and solar radiation data for Yuma, Arizona to determine appropriate environmental inputs for reliability analysis of outdoor electronic equipment. Yuma, Arizona weather data used in this analysis were obtained from AZMET, the Arizona Meteorological Network . The summer 0.4% design temperature (the temperature exceeded 35 hours in a given year) for Yuma, Arizona is 44.0oC. By this measure, there are only a few cities in the world that are hotter than Yuma. According to the ASHRAE 2001Handbook , the only cities in the world with a higher 0.4% design temperature are located in Saudi Arabia (45.2oC) and Kuwait (47.2oC). Figure 2. 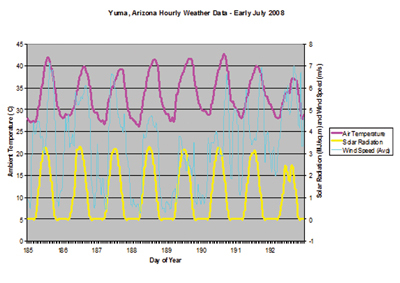 Hourly ambient temperatures for the first two weeks of January 2008 (2a) and July 2008 (2b) in Yuma, Arizona. Figure 2a shows hourly ambient temperatures in Yuma, Arizona from January 1, 2008 to January 15, 2008 obtained from AZMET. The average hourly ambient temperature for this period is 13.0oC. 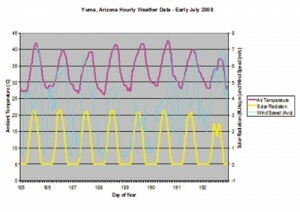 Figure 2b shows hourly ambient temperature in Yuma, Arizona from July 1, 2008 to July 15, 2008. The average hourly ambient temperature during this period is 33.4oC. Table 1. Seasonal and average annual ambient temperatures in Yuma, Arizona for 2008. Table 1 shows average seasonal ambient temperatures in Yuma, Arizona for the year 2008. Table 1 also shows that the Yuma average annual ambient temperature for all of 2008 was 22.9oC. Figure 3. Yuma, Arizona hourly wind speed, solar radiation and ambient temperature for the first six months of 2008. Figure 3 indicates a strong correlation among wind speed, ambient temperature, and solar radiation. Maximum wind speed occurs near the time of maximum ambient temperature. Maximum solar radiation occurs approximately three hours before the occurrence of maximum ambient temperature. For the time period shown, the lowest wind speed at the time of maximum ambient temperature is approximately 2.7 m/s (Day 190). The highest wind speed during this period is approximately 7.0 m/s (Day 185). The average hourly wind speed in Yuma, Arizona during 2008 was 2.5 m/s, including daytime and nighttime periods. MTBF estimates for outdoor electronics are lowest (i.e. failure rates are highest) in environments having the highest average ambient temperatures. The RRH examined in this paper exhibits board and passive component temperature rises of up to 35oC on a summer afternoon if the wind speed is zero. However, hot desert climates typically exhibit high winds during the daytime hours on summer days. These non-zero wind speeds significantly decrease equipment temperatures. 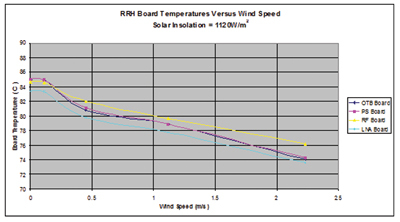 Figure 4 shows the effect of wind on RRH board temperatures. The wind was assumed to blow horizontally across the front and back of the RRH. The predictions were obtained from a computational-fluid-dynamics (CFD) thermal model of the RRH using a commercial code . The assumed ambient was 50oC. Solar load was applied to the RRH according to the method described in Telecordia GR 487-CORE, Issue 2 . This method simulates solar loading by applying heat sources to three contiguous sides of the RRH. Each heat source is equal to the solar insolation value multiplied by the solar absorptivity of the surface and its area. The model used a solar insolation of 1120 W/m2, the value prescribed by the European Telecommunications Standards Institute (ETSI) . The thermal model assumed that a sun shield covered the sun-facing heat sink of the RRH. Figure 4. RRH board temperatures vs. wind speed at 50°C ambient. Using the PS board as an example, a 1.1 m/s wind speed reduces its temperature by 6.0oC, while a 2.2 m/s wind speed reduces its temperature by 11.0oC, both compared to a zero wind speed condition. Hence, the 2.5 m/s average wind speed in Yuma, Arizona reduces the PS board temperature by at least 11.0oC versus calm wind conditions. For the RRH examined in this paper, the PS board temperature rise above ambient used in reliability models would be approximately 24.0oC instead of the zero-wind rise of 35.0oC. Assuming that the RRH sky-radiation temperature is the same as the outdoor ambient temperature, predictions from the CFD thermal model show that the board temperature rise due to maximum solar load is 3.0oC. The average solar rise during the day is approximately one-half this value, while the solar rise at night is zero. To be conservative, 1.5oC was used as the average solar rise for reliability modeling. Since the board rises shown in Figure 4 assume maximum solar load, the PS board temperature rise used in reliability models can be reduced by an additional 1.5oC giving a rise of 22.5oC. The RRH board temperatures used in reliability models are given in Table 2. All of these temperatures are higher than the 40.0oC default value assumed for electronics operating indoors. Hence, calculated MTBF is shorter for this RRH than if the use environment is assumed to be the default indoor environment. Methods of determining average operating conditions for outdoor equipment based on wind speed, solar load, and solar radiation are not addressed in reliability prediction procedures. Hence the need to determine appropriate environmental parameters for use in reliability models. Using published weather data, this paper defines realistic ambient temperatures, wind speeds and solar radiation conditions for Yuma, Arizona, one of the hottest cities in the United States. These can be used as baseline reliability environmental parameters to obtain MTBF estimates for electronic equipment operating in such an uncontrolled outdoor environment. A CFD thermal simulation of a typical RRH subjected to “maximum” solar load shows that a wind speed of 2.5 m/s reduces average board temperatures by 9.0oC to 11.0oC compared to assuming zero wind speed. The predicted average daytime solar rise of the boards is 1.5oC. All of the resulting board temperatures for use in reliability models are higher than the default 40.0oC value assumed for indoor electronics. Hence, calculated MTBF is shorter for this RRH than if the use environment is assumed to be the default indoor environment. Telcordia, SR-332-CORE – “Reliability Prediction Procedure for Electronic Equipment,” Issue 3, December 2010. American Society of Heating, Refrigeration and Air-Conditioning Engineers, Inc., 2001 ASHRAE Handbook, Chapter 27. Flotherm v7.2 from Flomerics, Inc, March 13, 2008. Telcordia, GR487-CORE. “Generic Requirements for Electronic Equipment Cabinets.” Issue 2, Section R3-187. Page 3-33, March 2000. ETSI EN 300 019-1-4 V2.1.1, Environmental Engineering (EE); Environmental Conditions and environmental tests for telecommunications equipment; Part 1-4: Classification of environmental conditions; Stationary use at non-weatherprotected locations, Section 5.1. Frederick Hawley is a Principal Reliability Engineer at CommScope, Inc. in Warren, NJ. He has over 35 years of experience in the field of telecommunications and military reliability engineering. His current work focuses on reliability prediction and reliability modeling of products and systems used in wireless communications. This includes integrated Remote Radio Heads, other tower mounted equipment and complex network equipment that provides wireless communications to sport stadiums. He holds a MSEE from Columbia University in New York. He is also a member of IEEE. Stephen Palaszewski is a Principal Engineer at CommScope, Inc. in Warren, NJ. He has over 25 years of experience in the design of cooling and environmental control systems for outdoor electronics. He is also experienced in accelerated life analysis and testing of outside plant products such as plastics, batteries and lasers. He is currently a thermal designer of Radio Frequency Power Amplifiers (RFPAs) and outdoor cabinet environmental control systems for RFPAs. He holds seven patents in the field of electronics cooling. He received his B.M.E., M.M.E. and Ph.D. degrees from the City University of New York.